One of the most important reasons we need to study church history is because Satan repurposes just about every error and heresy he has ever engineered or promoted. Seldom do you encounter a totally original false teaching. The evil one regularly takes advantage of the fact that human beings have short memories and are easily distracted. But by studying church history, we can equip ourselves to discern and resist his evil ways. In 1655, two hugely controversial books appeared in Europe. In these two books (which can be found here), Isaac La Peyrère argued that many other human beings had existed before and alongside Adam and Eve. He claimed that Adam was merely the ancestral father of the Jews. However, the Gentiles traced their lineage back to various “pre-Adamites.” To make his case, he appealed to Scripture, both the Old and New Testaments, although he did question the authority and authenticity of Scripture in many places. Today we hear talk again of pre-Adamites, although the arguments have shifted because of the wide acceptance of biological macro-evolution. If human beings have an evolutionary history, then we are necessarily looking at the existence of pre-Adamites. If macro-evolution is true and also applies to our species, then an historical Adam (if there was one) cannot have been immediately created by God from literal dust of the earth (cf. Gen. 2:7). Instead, this historical Adam was biologically created by the normal process of a sperm fertilizing an ovum. In other words, prior to being constituted as a human being (being endowed with the image of God), the being we call Adam had a biological father and mother – pre-Adamites. Plenty has been written recently to demonstrate that this contemporary argument for pre-Adamites is unbiblical. However, is there anything we can learn from Reformed engagement with previous forms of pre-Adamitism? Francis Turretin addressed La Peyrère’s arguments in his Institutes of Elenctic Theology in 1679. In the English translation, Turretin’s discussion takes up about six pages (pp. 457-462 of volume 1). This is a good summary of the issues, as well as an orthodox biblical response. But it was by far not the only response. 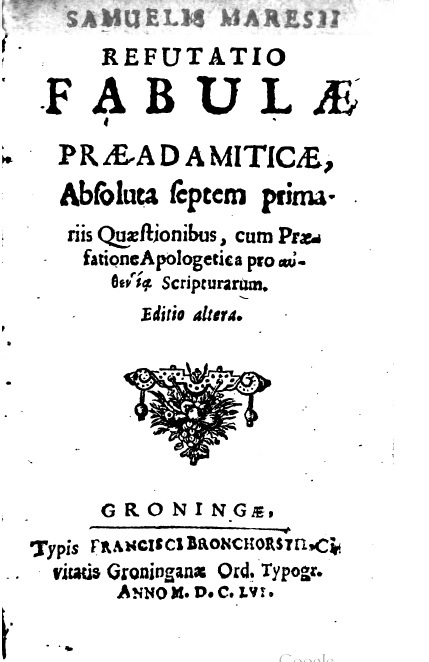 Just one year after La Peyrère published his pre-Adamite books, a full-length book response appeared from the pen of Samuel Maresius (1599-1673). Maresius was a Reformed theologian from France (his original surname was De Marets). When he responded to La Peyrère, he was a theology professor at the University of Groningen, in the northern Netherlands. Maresius’ book was entitled, A Refutation of the Fable of the Pre-Adamite: Accomplished in Seven Basic Questions. This volume appeared in several editions – the one I used in preparing this post contained 689 pages (you can find it here). As the title indicates, Maresius treats the topic through seven basic questions. However, he first of all writes a lengthy (109 pages) preface in which he defends the authenticity and authority of Scripture. That provides a window into his method in this volume. His answers to the questions are based first and foremost on Scripture. Yes, Maresius does bring in other supportive material as well, but the authoritative foundation is Scripture alone. Let’s now briefly look at the seven questions Maresius asks and see what can be learned from them in terms of our present-day engagement with pre-Adamitism. Even though the background is different, some of the questions have not changed and the answers are still relevant. 1. Is Adam the first of all men and is he to be acknowledged as the parent of the whole human race? Maresius answers in the affirmative. He supports his answer by appealing to Scripture passages, including Matthew 19:4-5. Matthew 19:4 says that God created male and female (Adam and Eve) at the beginning – which means the beginning of the universe, during the six days of creation. Adam was at the beginning and is therefore the first of all, the parent of the whole human race. Maresius understands that the issues at hand are not solved merely by looking at Genesis 1 and 2. Rather, Scripture must interpret Scripture. Jesus clearly believed that Adam was the first of all men, and therefore we ought to as well. 2. Is the forming of Adam and Eve described in Genesis 2 different in order and time from the creation of man in the image of God referred to in Genesis 1? This is to be denied, says Maresius. You cannot drive a wedge between the first two chapters of Genesis in an effort to make room for pre-Adamites. The man in Genesis 1 is the same as Adam in Genesis 2. La Peyrère argued to the contrary and it’s important to remember that background. Maresius argues that the first two chapters of Genesis present the same history of human origins from different perspectives. Moreover, he again appeals to other Scripture passages outside of Genesis to support his position. 3. Should the foundation of the world and human affairs be regarded as having taken place long before Adam? To this Maresius says, “No.” In other words, in answer to La Peyrère, he maintains a young-earth position. Any time someone starts introducing pre-Adamites, we run into the question of the age of the earth. Maresius had to deal with it, and so do we today. The biblical evidence runs in favour of a young earth. 4. Does it follow from what Paul says Romans 5:12-14 that other men existed before Adam? This was a nearly-clever argument introduced by La Peyrère. He reinterpreted Paul to be saying that there were other human beings before Adam who were lawless and sinful. But their actions were not considered sin until Adam came along and broke God’s command to him. This comes across as a radical attempt to reinterpret a problematic text for La Peyrère and Maresius recognizes it as such. It is simply sloppy exegesis to use Romans 5:12-14 to argue for pre-Adamites. Lesson: beware of the Scripture-twisting needed to support a refusal to believe what Scripture plainly reveals in Genesis 1 and 2. 5. Is it possible for the sin of Adam to be imputed to men not descended from him, or those who are pretended to have existed in the world long before him? Another way of putting this question: can the imputation of original sin be universal if Adam is not the head of the entire human race? Maresius denies this and argues that universal imputation requires a single head of the human race. In both old and new forms, pre-Adamitism is going to have human beings who are not biologically descended from Adam. If they are not descended from Adam, then Adam’s sin cannot be imputed to them. In La Peyrère’s version of pre-Adamitism, he also has human beings existing before Adam, and these too cannot be regarded as sharing in Adam’s sin. In whatever age pre-Adamites are proposed, it should be noted that a reconfiguration of the imputation of original sin becomes necessary. 6. Scripture frequently distinguishes between Jews and Gentiles. Can it be inferred from this that the latter are not descended from Adam, but instead from pre-Adamites? This question is peculiar to La Peyrère’s position. While we can note that Maresius denies this, I don’t think there’s anything that can be drawn from this in terms of relevance for our present-day discussions. 7. Was the flood of Noah universal? Maresius affirms a global flood in the days of Noah, contrary to what La Peyrère argued in his books. Like at least some contemporary advocates of pre-Adamites, La Peyrère maintained that the flood was a local phenomenon. Noah’s family, preserved in the flood, continued to represent the line of Adam. However, the Gentiles continued to exist in other parts of the world, unaffected by the flood in Noah’s locale. But Maresius points out that Scripture simply does not support this view. After all, Genesis 6:12 speaks of what precipitated the flood: universal corruption. Universal corruption requires universal punishment. After the flood, Genesis 10 provides genealogies which account for the existence of all peoples after Noah, including Gentiles. Maresius proves that arguing for a local flood requires the twisting and perversion of Scripture, and his arguments remain applicable today. There is a bit more to be gleaned from this episode in church history. 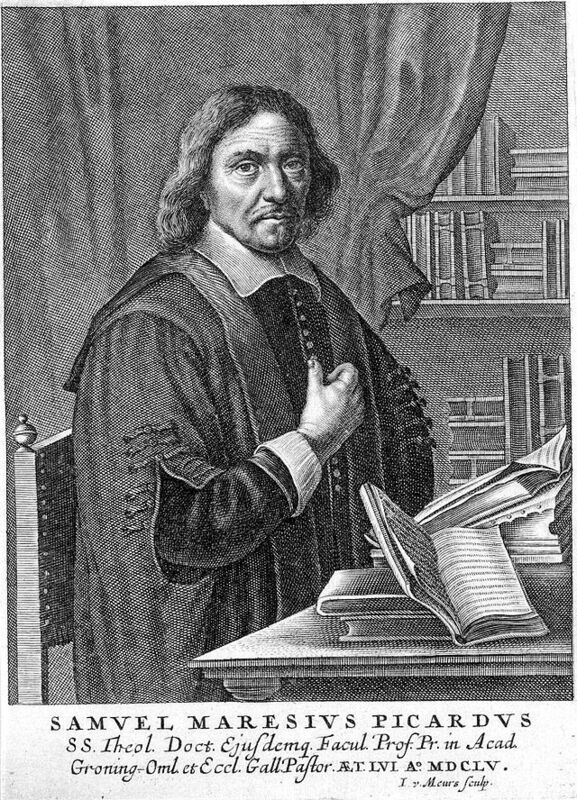 When La Peyrère wrote his books in 1655, he still identified as a Calvinist and was a member of the French Reformed Churches. He soon ended up being arrested by the Roman Catholics – they regarded him as an enemy of their faith too. Faced with their threats, he apologized to the Pope, recanted his views, and became a Roman Catholic in 1656. “Recanted,” however, is a term that can only be used loosely here. La Peyrère went through intellectual contortions to officially disavow his pre-Adamite views while actually still holding them. He wanted to save his life and his intellectual legacy. He actually wrote a defense in response to Maresius’ book, but did not publish it because of a promise to the Pope not to promote pre-Adamitism. There is sometimes more than meets the eye or ears. Sin is deceitful and the sin of unbelief no less so. Perhaps you’re wondering: if his views were so wrong, why was La Peyrère never disciplined by the French Reformed Churches? Well, it had been tried. Already in 1626, he was suspected of teaching and holding to unbiblical ideas, although it’s not clear whether pre-Adamitism was on his mind yet. His case went to a provincial synod of the French Reformed Churches. However, some 60 pastors defended him and he was acquitted. In his monograph on La Peyrère, Richard H. Popkin suggests that it was the La Peyrère family name which led to this outcome – they were well-respected and influential. Although no formal discipline took place, La Peyrère’s views were roundly condemned by Reformed theologians like Maresius and Turretin. They did what they could to broker no room for pre-Adamitism in the Reformed Churches of Europe. If there ought to have been no room then for La Peyrère’s form of pre-Adamitism, why should there be room now for a different form of pre-Adamitism with many of the same features? 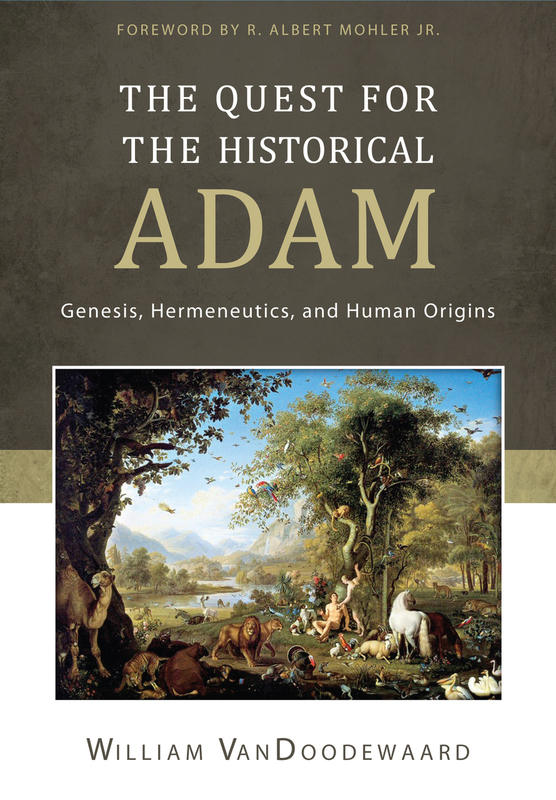 The Quest for the Historical Adam: Genesis, Hermeneutics, and Human Origins, William VanDoodewaard. Grand Rapids: Reformation Heritage Books, 2015. Hardcover, 400 pages, $37.85. Once in a very rare while I come across a book which brings me to think, “If I had the means, I would get a copy of this into every single Canadian Reformed home.” This is one of those books. If I couldn’t get it into every single CanRC home, I would settle for getting it into the hands of every single minister, elder, and deacon. The Quest for the Historical Adam is not only relevant, but crucially important for these days in which a biblical view of origins is under pressure. This volume could do a world of good if it would only receive the careful attention it deserves. The author, William VanDoodewaard, is a church history professor at Puritan Reformed Theological Seminary in Grand Rapids, Michigan. He is also a minister of the Associate Reformed Presbyterian Church (ARP). For those unfamiliar with this church, the ARP is a long-time member of the North American Presbyterian and Reformed Council (NAPARC). Alongside his seminary teaching, Dr. VanDoodewaard is also an ARP church planter in Grand Rapids. Apart from his doctoral dissertation, this is his first published book. The title of this volume plays off a much earlier book by Albert Schweitzer, The Quest of the Historical Jesus. In that book, Schweitzer examined how historical conceptions of Jesus led to a variety of Jesuses. While his book had some value, unfortunately, Schweitzer did not honour the authority of Scripture, so his conclusions were necessarily flawed. However, VanDoodewaard has the highest view of Scripture as he traces out how people have variously conceived of Adam. The author points that contemporary debates over origins are often afflicted with what he calls “historical amnesia.” This volume seeks to recover our collective memory of how ages past have written about, preached about, and thought about our first parents and their origins. The first chapter provides a general overview of what Scripture says about Adam. From this overview, the author reaches this conclusion, “…there is no inherent ground to posit anything aside from a special, temporally immediate creation of Adam and Eve as the first humans on the sixth day of creation” (18). The following five chapters trace out the post-biblical history of how Christians have looked at the early chapters of Genesis. If anything is clear from these chapters, it is that there has been a consensus view for millennia. The consensus is that the first chapters of Genesis must be taken seriously as a historical record. When it comes to human origins, the vast majority of Christian interpreters have understood Scripture to teach a special or immediate creation of Adam and Eve, a creation which allows for no prior biological ancestry of any sort. The Quest for the Historical Adam concludes with a chapter entitled, “What Difference Does It Make?” In this chapter, the author lays out ten areas of doctrine that are affected by how one views the origin of Adam. What are those ten areas? In Adam’s fall sinned we all? Dr. VanDoodewaard convincingly makes the case that no one can soundly argue that one’s view of origins can be hermetically sealed off from the rest of one’s theology. Even taking an agnostic view or allowing for latitude in the matter will invariably have some impact. The heart of the book is the historical overview. Let me mention five highlights that are worth sharing. There are many more highlights that I could mention, but I hope these five will whet your appetite and motivate you to buy the book. Today we sometimes encounter the idea of pre-Adamites – human beings or human-like creatures (hominids) who lived before and beside Adam. One of the first to promote a form of this idea was a Frenchman named Isaac La Peyrère (1596-1676). While he worked with the text of Genesis in his book Men Before Adam, he did so in a rather revisionist way. He argued that only the Jews were descended from Adam and Genesis 2 only described where the Jews came from. Everyone else came from other groups of human beings who had existed long before Adam. What motivated La Peyrère to develop this theory? He wanted to make Genesis more reasonable so that unbelievers would be more receptive to the Christian faith (143). Does this sound familiar? La Peyrère developed a small following in Europe. His ideas were widely discussed, but uniformly rejected by Reformed theologians. His ideas were also rejected by Roman Catholic figures such as Blaise Pascal (1623-1662). Following what Scripture taught on this matter, Pascal held to a young earth of about 6000 years age and “was also explicitly critical of pre-Adamite thought” (122). Another valuable contribution of VanDoodewaard is his critique of historian Ronald Numbers. Numbers wrote an influential 1992 book entitled The Creationists in which he argued that a literal understanding of the early chapters of Genesis only exists in our modern day because of the influence of American creation scientists, and particularly through the writing of a Seventh Day Adventist, George McCready Price. “However,” writes VanDoodewaard, “more thorough scholarship reveals significant evidence of a strong stream of both nineteenth- and twentieth-century sources that remained firmly in the millennia old tradition of a literal hermeneutic” (157). What Numbers and others have failed to see is that, entirely apart from twentieth-century creation science, theologians and clergymen have for centuries maintained a literal reading of Genesis, reaching their conclusions based on the text alone. Our author gives several good examples with Dutch-American Reformed theologians like Geerhardus Vos, William Heyns, Foppe Ten Hoor, and Louis Berkhof. An important part of the work of a historian is discerning patterns. The Quest for the Historical Adam reveals an important pattern in thinking about origins. It starts with sources outside of Scripture and Christian theology pressuring an alternative explanation – these sources could be philosophical, scientific, literary, or archaeological. Under that pressure, interpreters begin to make allowances for alternative explanations. Other generations eventually arise which take things a step further and assert these alternative explanations more stridently, also following through on their logical consequences. This pattern is evident throughout the book. Some argued that the confessional standards of the Westminster Confession of Faith and Catechisms provided sufficient clarity on the topic – positing that if there were concerns, they ought to be pursued through the means of church discipline. Other delegates held that belief in evolutionary biological processes in human origins, as circumscribed by Collins, Keller, or others, was harmonious with Scripture and represented a legitimate latitude of ecclesiastical theology (248). These two lines of argument paralyzed the PCA and prevented it from taking a stand. The result is that various forms of theistic evolution continue to have a comfortable home in the PCA and very little, if anything, can be done about it. Will we in the Canadian Reformed Churches learn from this history while the opportunity is still there? Obviously, I have a great deal of appreciation for this book. However, there are a couple of oversights that I noticed. Chapter 3 deals with “Adam in the Reformation and Post-Reformation Eras.” While the author does spend some time with the Westminster Standards (especially the issue of “in the space of six days”), he disregards the Three Forms of Unity or other Reformed confessions. This is important in our day when we hear it asserted by some that theistic evolution falls within the bounds of our confessions. Nevertheless, VanDoodewaard’s research certainly does support the position that in the era in which these confessions were originally written, it would have been unthinkable for forms of theistic evolution to be tolerated in Reformed churches. Chapter 6 deals with the 1950s to the present. The author has some discussion about developments in the Christian Reformed Church, but there could have been more said. For instance, it would be helpful for readers to see how the tolerance of theistic evolution in the CRC grew out of a weakened view of biblical authority starting in the 1950s, especially under the influence of the Free University of Amsterdam. The Quest for the Historical Adam is a unique contribution to a vitally important topic. It might be a bit technical at times for some readers, but those who persevere will be rewarded. As intimated in my introduction, this is especially an important book for office bearers. As those who have promised to “oppose, refute, and help prevent” errors conflicting with God’s Word, we need to educate ourselves about those errors and the patterns that lead to them being accepted. This is all the more case when an error is right before us, threatening to undo us. I heartily commend Dr. VanDoodewaard for writing this valuable book and Reformation Heritage Books for publishing it. May the day hasten when historians look back and say that the publication of this book was a turning point for the maintenance of orthodoxy on origins! This review was originally published in Reformed Perspective magazine and reappears here with their gracious permission.